ZQuiet is a dentist-designed anti-snoring mouthpiece that advances your lower jaw by a few millimeters to prevent the base of your tongue blocking your airway. If you snore when lying on your back and after drinking alcohol, or if you are overweight and have a weak lower jaw, you may find that ZQuiet’s slogan “Pop it in and the noise is gone” is applicable to you. The device looks simple, but with its thin, flexible and springy materials, this hinged mouthpiece is intelligently designed and ranks as one of the most effective anti-snoring remedies available. Thanks to our partnership with ZQuiet, you can save $10 on your purchase with an exclusive SnoreLab discount code. The ZQuiet mouthpiece is a mandibular advancement device (MAD), which is one the most effective categories of anti-snoring device. Snoring is the vibration of soft tissue in your throat caused by a narrowing of the airways. ZQuiet works by advancing the lower jaw (mandible) forward by a few millimeters to reduce blockage of the airway, enabling clear and quiet breathing. MADs like ZQuiet are also effective treatment methods for mild obstructive sleep apnea. This is a condition where your airway becomes so obstructed that breathing periodically stops, meaning you repeatedly gasp awake throughout the night. You may well discover that after sleeping with ZQuiet you feel much more awake and refreshed the next day. 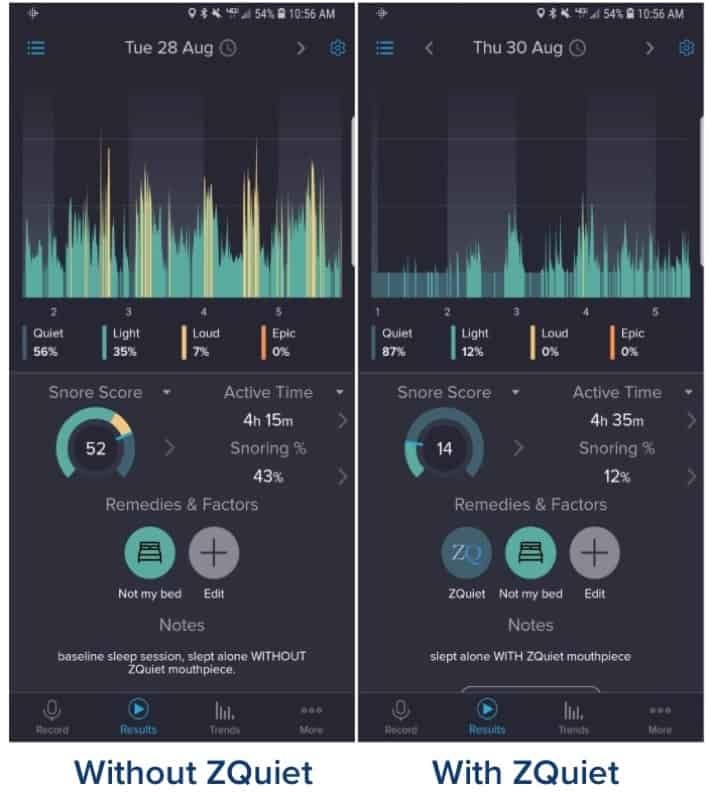 SnoreLab has monitored millions of nights of sleep, providing unique insights into the anti-snoring products that really work (and the ones that don’t). Our users put ZQuiet to the test. We collect a summary of our users results on a strictly anonymous basis so that we can provide them with insights into to the best anti-snoring products to try. In the case of ZQuiet, the product really works very well. 70% of people trying ZQuiet had their snoring significantly reduced. Snoring was effectively eliminated for more than half of those people. 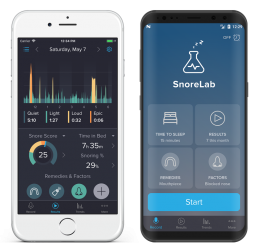 The average reduction in SnoreLab’s Snore Score was 70%. These results place ZQuiet amongst the very best consumer anti-snoring devices tracked by SnoreLab. The ZQuiet mouthpiece is one of many MADs available on the anti-snoring market. However, this device stands out due to some intelligent features that make it more effective, more comfortable and better value than many other generic mouthpieces. ZQuiet uses springy materials and a hinged design to give you a comfortable fit with the ability to breathe naturally. Other anti-snoring mouthpieces hold your jaw in a clenched position and can cause panic if they restrict mouth breathing. ZQuiet’s patented “living hinge” allows you to open your mouth, breathe naturally and even take a drink of water. The ZQuiet mouthpiece is thin and lightweight, spurning the bulk and discomfort of some other generic devices. Using BPA-free, FDA-approved thermoplastic elastomers, the mouthpiece is safe to use and lasts for a long time. Unlike “boil-and-bite” devices, ZQuiet is ready to use straight out of the box. It requires no molding and no adjustments. ZQuiet is specifically designed to fit nearly everyone. Simply “pop it in” and you should start seeing results in the very first night. The ZQuiet set includes two different sizes, each providing a different level of jaw advancement. Size A is the more comfortable option that is easier to use straight away as it provides a smaller degree of advancement. If your snoring persists, size B gives greater jaw advancement, creating more airway space. Having two mouthpieces means there are options for different types of snorer. It also allows you and your partner to each try ZQuiet. Using SnoreLab can be an excellent way of discovering which size is best for you. There are very few people who cannot use ZQuiet (denture wearers should visit ZQuiet’s FAQs). Whilst people with excessively loud snoring would probably benefit more from CPAP, SnoreLab still found that there was some success in users with very high Snore Scores. Additionally, by allowing mouth breathing via the hinged design, having a blocked nose is no blockage to using ZQuiet. SnoreLab has found that the ZQuiet mouthpiece achieved better results than many other mouthpieces, with 70% of users showing significant reductions in their snoring. The intelligent design in two different sizes makes ZQuiet suitable for most snorers, allowing for greater comfort and more natural breathing. Thanks to our partnership with ZQuiet, you can get $10 off your purchase with an exclusive SnoreLab discount code.